Samuel Ortom (Benue), Simon Lalong (Plateau), Umar Ganduje (Kano) and Aminu Tambuwal (Sokoto) have retained their seats after the collation of Saturday’s supplementary polls. But their challengers – Emmanuel Jime (Benue), Jeremiah Useni (Plateau), Aliyu Sokoto (Sokoto) and Abba Yusuf (Kano), have rejected the results as announced by the Independent National Electoral Commission (INEC) at the close of the second ballot yesterday. They plan to seek judicial redress. Ortom of the Peoples Democratic Party (PDP) polled 434,473 to defeat his All Progressives Congress (APC) challenger Jime, who scored 345,155; incumbent Plateau helmsman and APC candidate Lalong beat his PDP challenger Useni and Tambuwal of the PDP scored 512, 002 to beat APC’s Sokoto, who polled 511,660. The INEC had declared elections inconclusive in six states as there were no clear winners on the first ballot on March 9. The states are: Adamawa, Benue, Bauchi, Kano, Plateau and Sokoto. The commission fixed March 23 for makeup polls but a court barred the electoral umpire from going ahead in Adamawa and in Bauchi’s Tafawa Balewa Local Government Area. 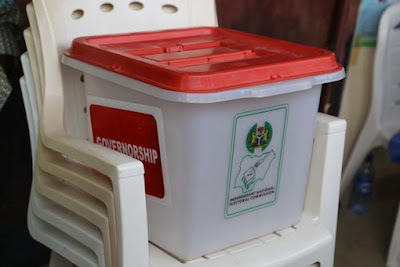 An Abuja Federal Court will today rule on INEC’s application to vacate an ex parte order barring it from conducting supplementary poll in Tafawa Belewa Council Area. Also tomorrow in Adamawa, a High Court will rule in an objection suit filed INEC against order obtained by Movement for the Restoration and Defence of Democracy (MRDD) governorship candidate Rev. Eric Theman, challenging the exclusion of his name of the ballot paper. Tambuwal, was returned after a keen contest with a lead margin of 342 votes. In the earlier results before the makeup poll, Tambuwal had 489,558 votes, leading with 3,413 as against APC’s Sokoto’s 486,145. Declaring the results in Sokoto yesterday at the Sultan Muhammadu Maccido Institute for Quranic and General Studies, venue of the collation, the Returning Officer and Vice Chancellor of the Jigawa State University, Dutse, Prof Fatima Batulli Mukhtar, said the APC got 25,515 and the PDP scored 22, 444 from the 22 local government areas where the makeup was conducted. According to Mukhtar, 50, 332 of the 95,022 registered voters were accredited. Those whose votes were valid were 48,309 and 1,580 were rejected. Merging the final results, the Returning Officer said the PDP scored 512,000; APC returned 511,660 votes with a total registered voters of 1,887,767 and 1,083,413 accredited for the exercise. Prof Mukhtar also gave the valid votes as 1,036,336 with 31,662 as rejected votes while 1,067,990 represented total votes cast. In a swift reaction to the declaration, APC agent and campaign Director-General, Alhaji Muhammadu Maigari Dingyadi, objected to the presentation of the results from Kebbe Local Government Area on two issues – malfunctioning Smart Card Reader and non-conduct of the exercise in some polling units. He urged INEC to look into his observations. The electoral body noted the observations and complaints raised by the APC, saying that it will be in its record for possible attention. PDP supporters and well-wishers took to the streets to celebrate the victory. After days of intense suspense, emotional and psychological torture among the Benue populace, INEC yesterday returned Ortom as winner of the supplementary governorship poll. The election was declared inconclusive because the number of votes cancelled in areas where elections were disrupted was more than the margin of lead by Ortom after the March 9 governorship election. State Collation Officer Prof. Sebastine Maimako, Vice Chancellor, University of Jos, announced Ortom as winner having satisfied the requirements stipulated in the Electoral Act and guidelines for the declaration of winner of the election. The final statistics as announced by Maimako showed that 858,947 of the 2,471,894 registered voters were accredited for the election. The valid votes were 830,954; rejected votes (15,268) and the valid votes were 846,222. The INEC declared Lalong as winner of the election. The governor was declared the winner by the Returning Officer, Prof Richard Anande Kimbir, Vice Chancellor of the University of Agriculture, Makurdi, Benue State. Announcing the final results, Prof Kimbir said, Simon Lalong of the APC polled 595, 582 votes to beat Useni of the PDP, who scored 546, 813. “I hereby declare Simon Lalong of APC returned as governor of Plateau State, having polled the highest numbers of votes in the state’s governorship election,” the returning officer said. Results of the supplementary election held in nine local government areas, including Langtang South, Barkin Ladi, Bassa, Bokkos, Jos North, Kanam, Mangu, shendam and Pankshin, showed that Lalong scored 12,327 new votes. The candidate of the Peoples Democratic Party (PDP), Jeremiah Useni, earned 8,487. The result of the supplementary was, therefore, added to that of the main election before it was announced. In Bauchi State, the PDP candidate Senator Bala was leading incumbent Governor Mohammed Abubakar of the APC in the supplementary governorship election conducted in 36 Polling Units (PUs), covering 29 Registration Areas (Wards) in 15 local government areas. The makeup poll did not hold in the Tafawa Balewa Local Government Area, owing to a court order. Mohammed garnered 6376 votes against Abubakar’s 5117 votes on Saturday. He was leading the incumbent with 1259 between both parties. The result was announced in Bauchi yesterday by the Returning Officer, Prof. Mohammed Kyari, Vice Chancellor of the Modibbo Adama University of Technology, Yola. At the close of the ballot on March 9, Mohammed had 469,512 votes. Abubakar had 465,453. The 4059 lead margin prompted INEC to declare the poll inconclusive after a Federal High Court in Abuja halted the collation and announcement of results for the Tafawa Balewa Local Government Area. Abubakar got a court injunction restraining INEC from continuing with the collation and announcement of election results. Judgment will be delivered today. The total votes scored so far by Mohammed in the 19 out of the 20 council areas has increased to 475,888. Abubakar’s stands at 470, 570 votes. The difference is 5,318 votes. The PDP yesterday urged the governor to concede defeat and work together with the party for the progress of the state. Speaking in a telephone interview with The Nation, PDP Chairman, Hamza Koshe Akuyam said the “right thing for the governor to do is to surrender in the face of an imminent defeat”. Mohammed has expressed gratitude to the people for their support. The former FCT minister addressed a news conference at the Command Guest House in Bauchi immediately the results of the election were announced. Incumbent Governor Umar Ganduje of the APC was last night declared winner of the makeup governorship election Kano State. Declaring the winner of the poll, Collation Officer Prof. Bello Shehu said that after merging the final results, the APC candidate polled 1,033,695, while his challenger Abba Yusuf of the PDP scored 1,024,713 votes. He said that 2,268,305 of the 5,426,989 registered were accredited. The valid votes cast stood at 2,199,535 and 50,861 were rejected. Those who cast their ballot were 2,242,396. He added that the APC candidate defeated his opponent with 8,982 votes. According to Shehu, the winner was declared after the collation of results from all the 28 affected Local government areas where the supplementary elections held on Saturday. The collation officer said that the governorship election was earlier declared inconclusive following the high number of cancellation of votes as a result of violence and over voting. According to him, the total number of votes cancelled during March 9 election was more that the margin between the PDP candidate, who was leading with 26,000 votes and that of the APC candidate. Yusuf was earlier declared to have 1,014,474, against the APC candidate Gov Ganduje who garned 987,819 votes. The votes cancelled during the first ballot were 128,572 and the collation officer said the electoral act stipulates that such election must be declared inconclusive. The PDP agent, who is also the party chairman in the state, Suleiman Rabiu Bichi frowned at the conduct and rejected the entire supplementary election process, especially that of Gama in Nassarawa Local Government Area. His APC counterpart, Abdullahi Abbas, described the election as another landmark victory for the APC, adding that the era of politicking is over. “Our doors are wide open to embrace the PDP for a better governance”, the APC chair said.